For those who have lake houses and mountain cabins, rustic design elements remain popular, but we’re seeing the introduction of patina into all interior styles. When we write about this trend or any subject that involves the style, we file the post under this tag. Our faux bois collection contains a number of rustic offerings. The Kirwin Bench has graceful arcing branches wavy along its back. Made of concrete over an iron frame in the lauded tradition of fine faux bois, the bench has been treated to a Portland finish. The Countryhouse Coat Tree may hang its hat on whimsy but we predict this will become one of your favorite elegant faux bois accessories. And this decorative element has a definitive purpose: it puts its stiff coatrack competition to shame with its graceful lines and nod to nature. The Quest Table Lamp may give the impression that its lived a long life but the concrete base finished in a rustic gray is as new, and fresh in style, as a recent sunrise. The distressed lamp is one of those elements that will add a hint of texture to a space. 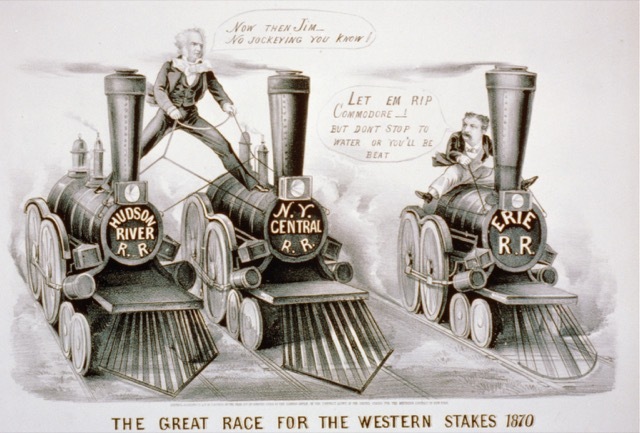 “The Great Race for the Western Stakes, 1870,” Cornelius Vanderbilt versus James Fisk; Currier & Ives lithograph. During the late nineteenth century, industrial families amassing great fortunes began building expansive mansions on Fifth Avenue that they filled with sumptuous furnishings and accoutrements. The list of who’s who included the now-famous names of Astor, Vanderbilt, Carnegie and Morgan. The captains of industry who led these families into a new era of American power made their fortunes in commodities like steel, and the expansion of transportation through railroads and shipping. Can’t you just imagine the energy that would have been vibrating as molten steel was poured into molds for beams and pipes, and welding rods sparked on the hulls of new ships and the barrel-shaped bodies of locomotive engines? 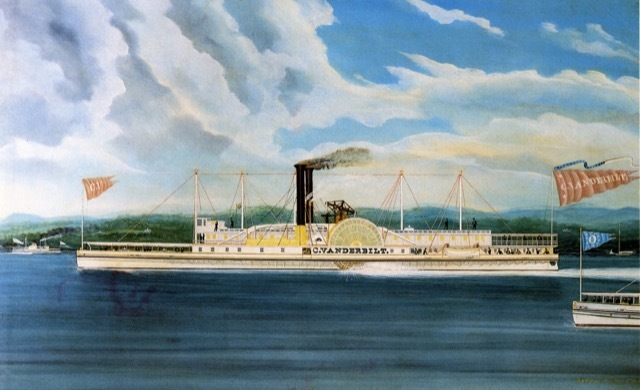 The C. Vanderbilt, a Hudson River steamer owned by Cornelius Vanderbilt, rendered in oil on canvas by James and John Bard. We can trace the industrial chic style that flourishes now back to these tycoons so we thought we’d give them a nod in this post that gives you a sneak peek at some of the new products we will debut during High Point Market in October. The association is so perfect because we’ve noticed quite a few offerings with that strapping charm we know any magnate would see as a celebration of his penchant for the rugged manufacturing model. But before we get to the handsome pieces we’ll unveil, we thought we’d remind you that Las Vegas Market is almost upon us and tell you about a fun giveaway. 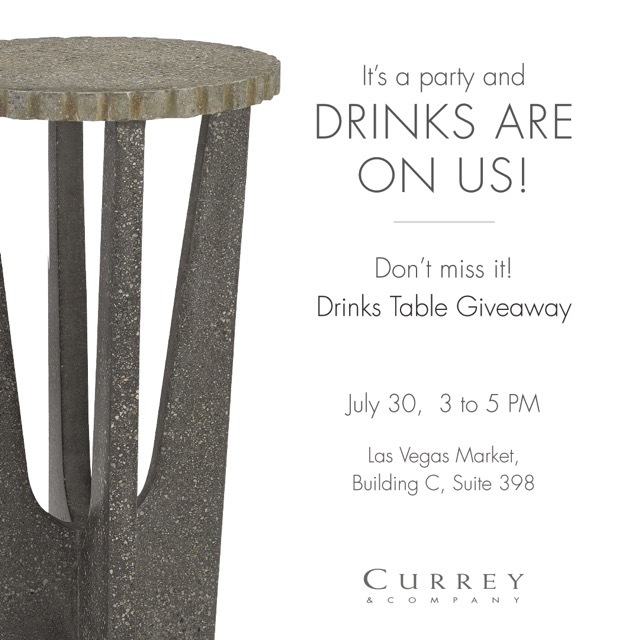 From July 29 through August 2, you’ll find us at Las Vegas Market in Building C, Suite 398; and on July 30 from 3 to 5 pm, we’ll be giving away the Warner drinks table, one of our new bestsellers made of concrete. The stippling on this little number peeks through a polished surface through which the pebbles are revealed. It’s the fluted edge of the top and the cut-outs in the elongated base that give this small piece a pop of the fanciful. The material from which it is made makes it a shoe-in for this industrial chic lineup. Be sure to come by and put your name in the hat to win this happy-hour hit! Currey & Company Kabuto pendant will debut in High Point. 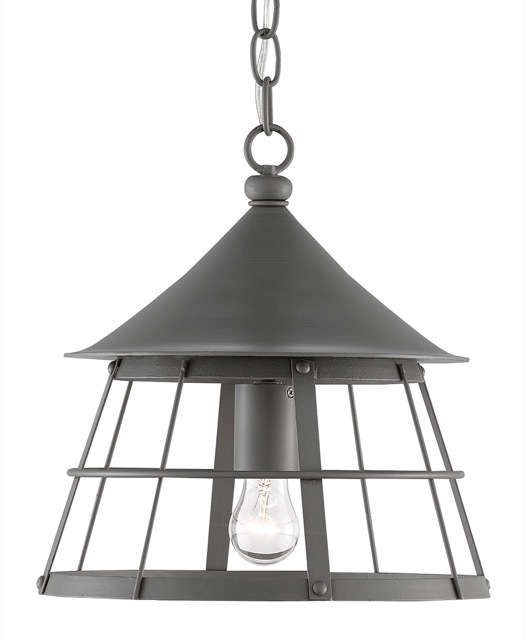 Our new Kabuto pendant has a handsome wire cage that extends from a canopy in the same finish. What I believe makes this luminary so striking is the slight flair of the hat-like shape from which it suspends. 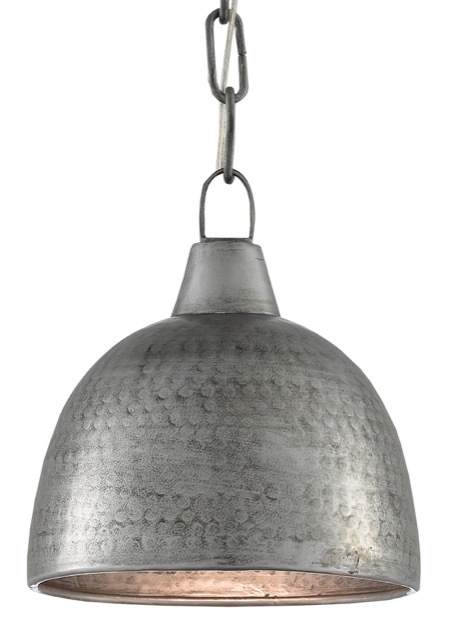 The Warehouse pendant designed by Iian Thornton. A shout-out to our designer Iian Thornton for envisioning this industrial chic powerhouse that we’ve named the Warehouse pendant. It will be holding its bulbs high during Market so come by and give it a glance! 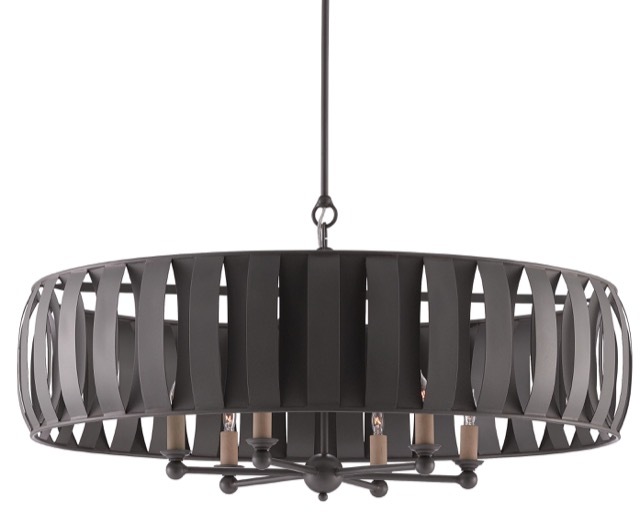 Our Tigerton chandelier will be new at #HPMkt. We’re betting the Tigerton chandelier will whirl its way into the heart of any lover of rugged charm, and not just for its cagy character but for the patterns it will reflect on surrounding surfaces. This version of our Earthshine pendant has inspired other designs. Our ever-popular Earthshine pendant, shown above, has birthed a few brawny brothers that will debut in October. 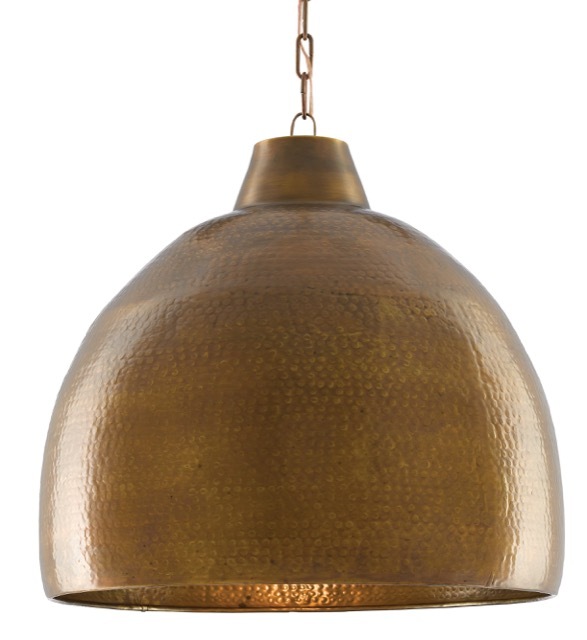 Our Earthshine pendant in a brilliant brass finish. 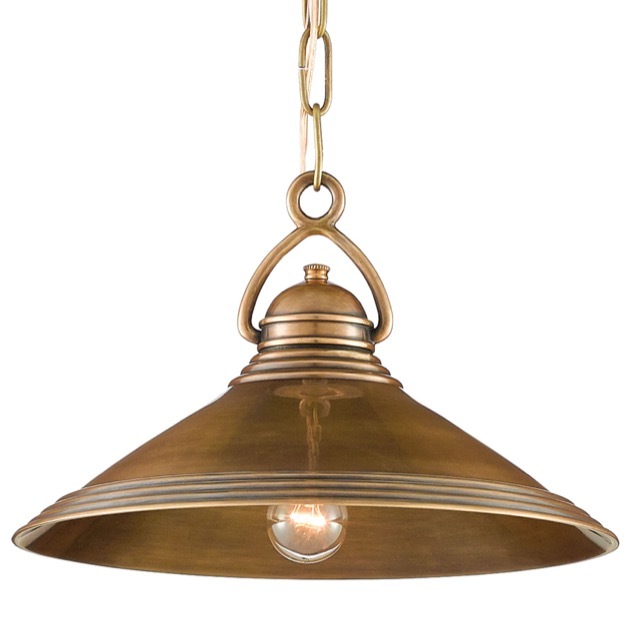 We’ve given the Earthshine pendant a new brazenness by treating it to a brilliant brass finish. You’ll see it glinting overhead during High Point Market. Our Earthshine Petit pedant in a blackened steel finish. The Earthshine Petit pedant in the same blackened steel as the original has just as much grit as its bigger brother, though it is very small by comparison. 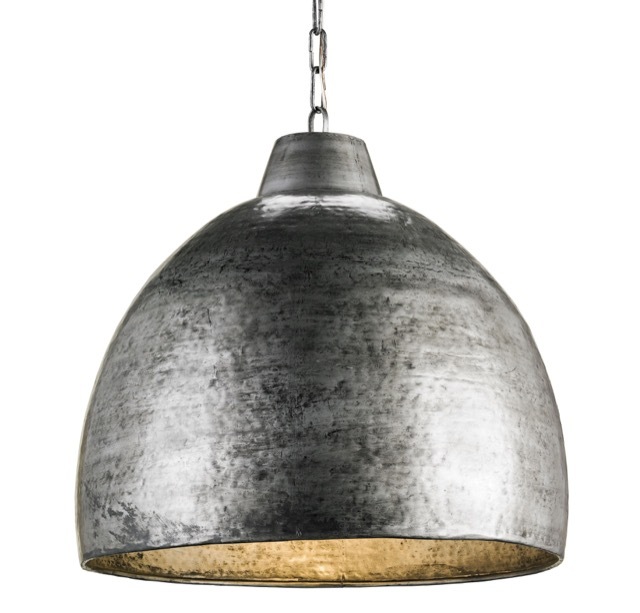 The Weybright pendant has so many industrial chic references. Our new Weybright pendant references so many vintage industrial notes, it will have a nuts-and-bolts appeal to anyone who still dreams of the days of steamer ships, newspaper illustrators in visors and the local butcher who cleaved the freshest of meat to beams in his chill locker. 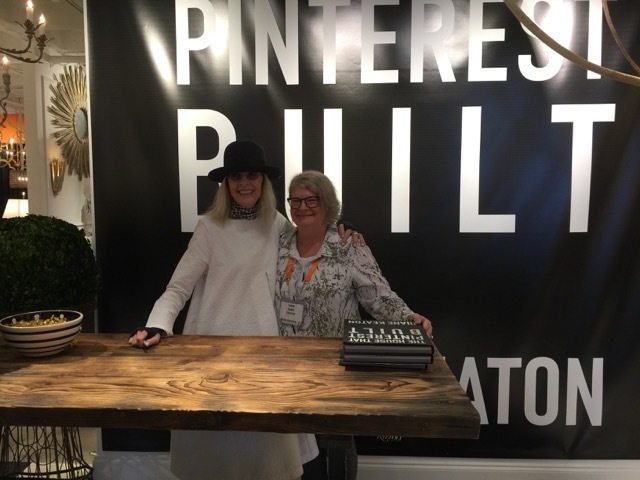 Yours truly with Diane Keaton during Atlanta Market. We just wrapped Atlanta Market where we assisted Aidan Gray in helping keep the hundreds of fans that queued up to have her sign their copy of her book The House That Pinterest Built happy. She says in the book, “I wanted a down-home dream home unencumbered with fancy.” She achieved this by choosing materials, furnishings and finishes that reflect an industrial chic point of view, one for which we salute the actress as we continue to introduce rugged designs that have a strong dose of charm. 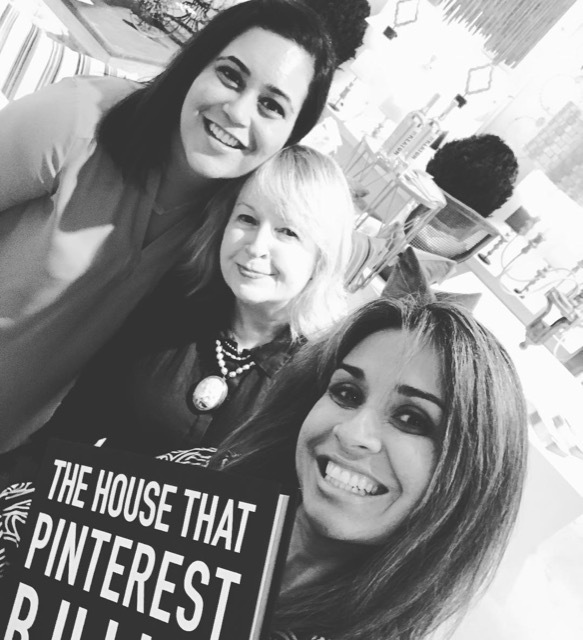 Currey & Company Atlanta showroom manager Shephalli Jain, Bethanne Matari and Vivi Mira-Culmer, a Currey sales rep snagged copies of Diane Keaton’s book during Atlanta Market. 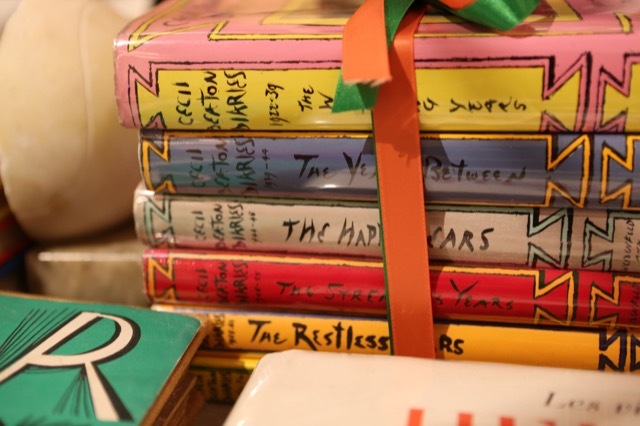 A collection of Cecil Beaton’s notebooks brought to our High Point showroom by Potterton Books. 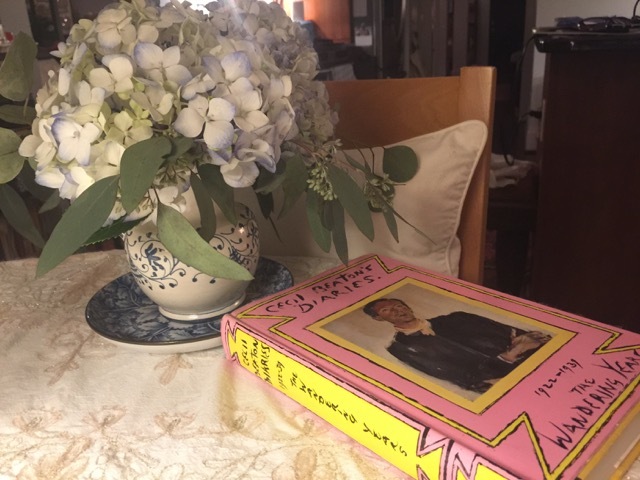 Known for his portraits of the rich and famous (and royal), Cecil Beaton is also legendary for his tell-all diaries in which he records gossip about the well-heeled and details about life in what we would call the fast-lane today, though the ships and trains he frequented were anything but speedy. He wrote a fabulously snarky entry in his diary during a visit to New York City in April of 1973 in which he lambasts one of the wives of the era’s magnates on Easter Sunday. 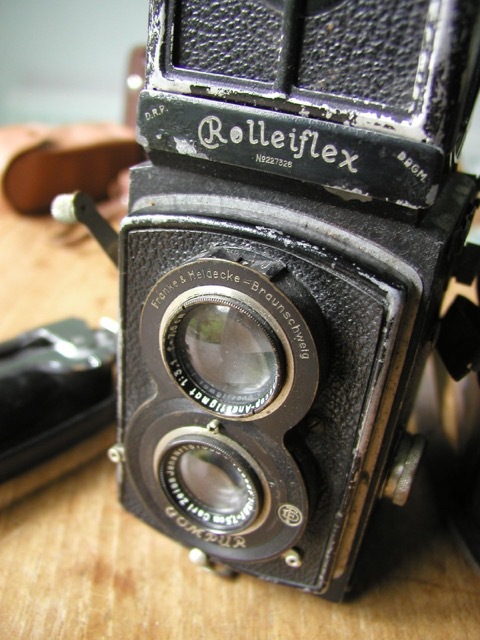 Cecil Beaton used a Folleiflex for some of his most famous photographs. Looking back, this is a true industrial chic design. Image courtesy WikiMedia and Wapster. “Mrs. Cornelius Vanderbilt, in a Queen Mary flowered toque, used to be photographed at church parade. Now, after the Easter Sunday service, Fifth Avenue is blocked off to become a jostling mass of humanity garbed in the most incredible fancy dress,” he writes. “Another sign of the deterioration of taste and standards. The few respectable people look like dodos.” Now that’s what we call putting some muscle into your critique of the Industrial Age’s elite! This entry was posted in Currey & Company, Market, Products and tagged black, Chandeliers, design influencers, Events, Gold, Gray, Lighting, occasional tables, organic shapes, Rustic on July 19, 2018 by Saxon Henry.